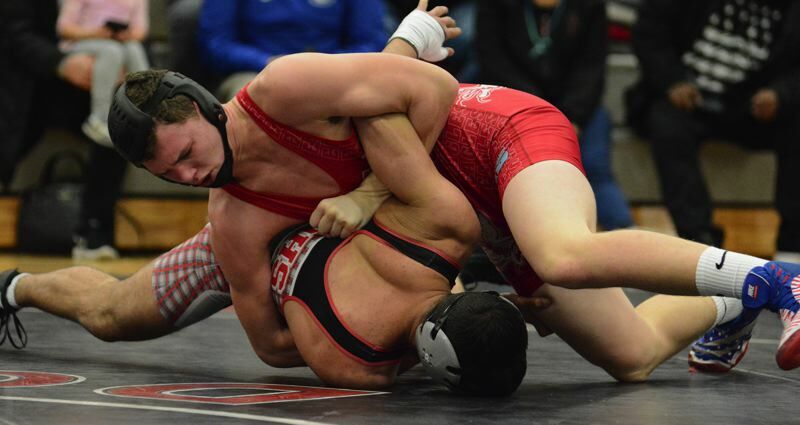 Centennial's Bailey Sparks had done everything possible and hoped it was enough to lead the Eagles to a dual victory Wednesday night at David Douglas — the reigning Mount Hood Conference champions. Now, all he could do was wait on the sideline and watch. Bailey used an early takedown and near-fall to build a 5-0 first-period lead in his 170-pound bout. "I kept trying for the pin, and finally I caught him in a bad position, rolled my hips over and didn't think he could get out of it," Bailey said. His opponent could not twist to safety. Sparks heard the referee slap the mat midway through the second period, sending a line of his teammates leaping into the air to celebrate a 22-point team lead with four bouts remaining. "That sets us up with a pretty big lead, and it's going to make it hard for them to catch us," Bailey said. The Scots were forced to score falls in the remaining weight classes. Romeo Manue obliged at 182 pounds, and Josiah Green flattened his opponent with 0:19 left in his 195-pound bout. Joey Franco was issued a forfeit at 220 pounds, and the Scots were within four points. 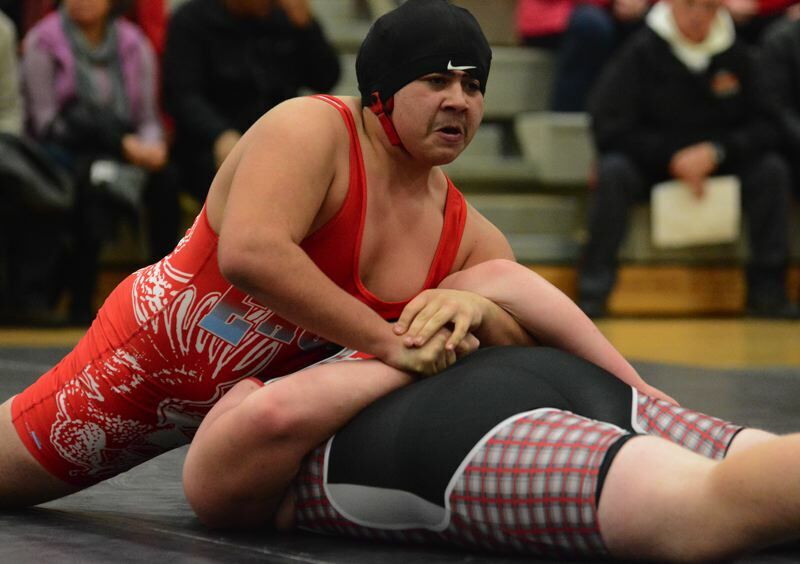 But Centennial heavyweight Ihe Gonzales stood in the path to a Scots' victory like a boulder fallen onto a cliffside roadway. Getting a fall against the Eagles' senior was a tall task. Gonzales took command from the opening whistle, trapping his opponent's arm for a takedown 50 seconds into the match and quickly rolling him over for the pin. "The feeling was intense," Gonzales said. "I gave it my all and did what I had to do. Being able to flip him was a great feeling." 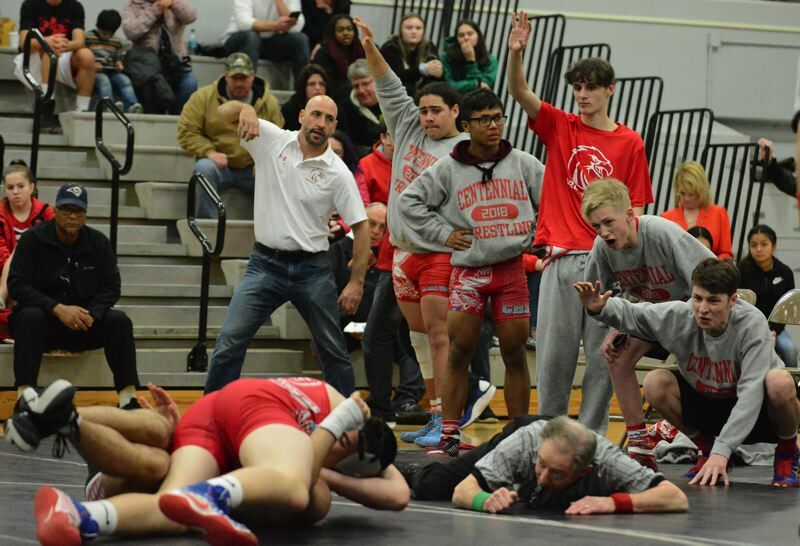 The pin secured Centennial's 42-32 team victory and gives the Eagles the inside track for second place in the league ladder heading into next month's district tournament. Centennial won 6 of 7 bouts in the lightweights, sparked by Jeremiah Van Cleve's 8-4 decision at 113 pounds. He successfully shot in on the right ankle of Douglas' Hayden Narruhn several times early in the match. With the score tied late in the second period, Van Cleve tried the maneuver once more. Narruhn deflected him away, but Van Cleve adjusted in a flash with an upper-body attack for a takedown and a 5-4 lead. "I've been getting people with ankles a lot this season, so I tried it early and it worked, so I kept going to it," Van Cleve said. He added an escape point on his opening move of the third period only to see Narruhn get in on his leg for a potential tying takedown. "I shifted my legs around and just kept hopping trying to get to the side and start over," Van Cleve said. It took about 20 seconds on one leg for Van Cleve to tumble outside the circle, but he retained his two-point lead and earned a restart in the center circle. Van Cleve tripped out his opponent for the clinching takedown with 0:32 left. Teammate Riley Salazar (145) walked around his opponent's head to earn a five count on back points to score a 4-2 come-from-behind decision. Even in losses, the Eagles earned an edge in the team tally. Kobe Hein (152) fought off pin attempts by Ruslan Pilat over the final 20 seconds of the first period and the second period, and avoided trouble once more midway through the third. Centennial's Mark Medivil (160) pulled off a similar feat in the next bout after the Scots' Omarr Narruhn scored three takedowns in the first two minutes of their bout. 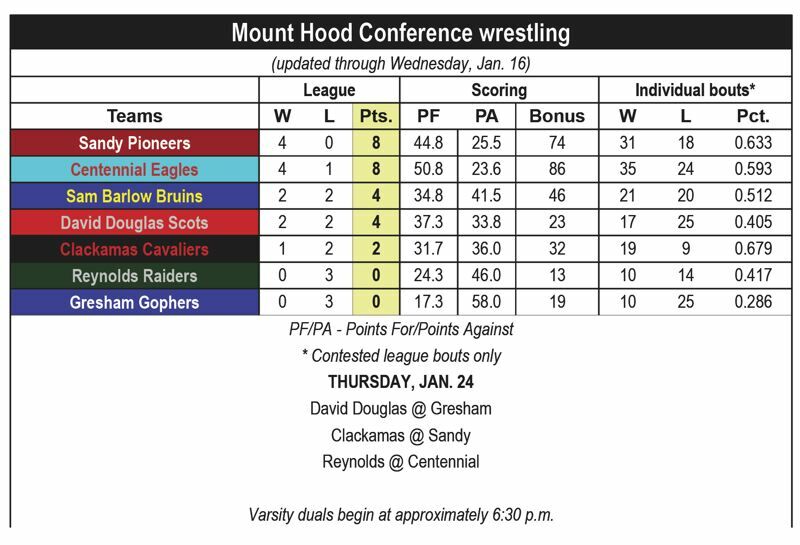 Both Centennial wrestlers stayed off the back, forcing the Scots to settle for major decisions instead of pins, which resulted in a four-point shift in the team score. David Douglas earned its first points when Damauri Crawley (126) scored a takedown late in the first period that ended in an injury default after Centennial's Mufezul Yusun appeared to have broken his arm and was taken away in an ambulance. Both schools are competing at the elite Oregon Classic tournament this weekend in Prineville.